Protecting your chimney is a vital part of your home's well-being, and the Draft King 10 in. 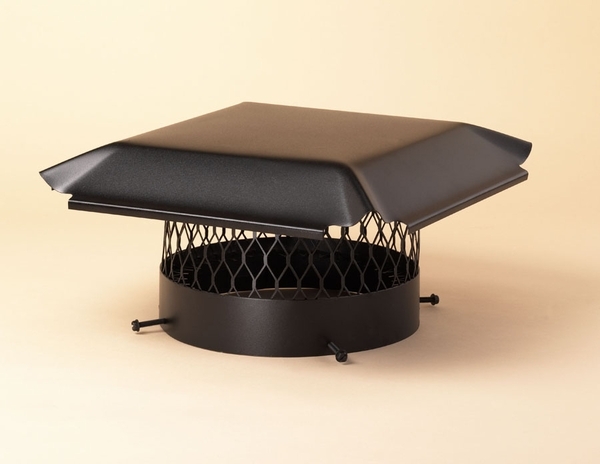 Black Painted Galvanized Steel Round Bolt-On Single Flue Chimney Cover not only helps protect your chimney, but it also adds a beautiful, distinctive architectural element to the rooftop and to the home itself. Protecting the chimney from moisture and helping the fireplace draft perfectly are practical matters that can't be ignored, but the savvy homeowner can take care of the functional aspects of the home in a way that adds a finished and sophisticated look to the overall product. Who could resist the look of a painted black 24 gauge 100% galvanized steel hood with scalloped corners and a drip edge? Who wouldn't be tempted by an 18 gauge galvanized steel mesh standing majestically as it protects the chimney from birds and other animal pests? Probably not many people. However, for those people the Draft King 10 in. Black Painted Galvanized Steel Round Bolt-On Single Flue Chimney Cover also offers an outside mount that provides added air space for a perfect draft, a 14 gauge galvanized steel base for added stability, and slotted hex head bolts for a firm, easy mount. The metal mesh is even turned inward at the base to rest perfectly on the flue tile and close all the gaps. If all calculations are correct, then there shouldn't be anyone not interested in this amazingly high-quality chimney cap. If there are still any uninterested parties, then those people probably don't have a chimney. For those who do have chimneys, though, the Draft King 10 in. Black Painted Galvanized Steel Round Bolt-On Single Flue Chimney Cover is the ideal way to turn a value-adding part of your home into an exterior visual element that is truly eye-catching. My only concern is keeping the rain out. Haven't had a driving rain yet, but so far, so good. I had no problem installing the unit. It certainly improved the appearance and will probably out last my existence. Easy to use web site good product at a fair price. Easy to install and well made out of heavy gauge metal. Even though we had owned our current outdoor wood burner for about a decade, our insurance company came along and recently requested that we purchase a chimney cap for it. We decided that while stainless steel was a nice way to go, we did not want to spend an exorbitant amount of money on a cap. We selected this cap, and so far the results have been simply stunning.